Shortly after she enters the courtroom disguised as a young lawyer, Portia asks the defendant and plaintiff to identify themselves. Generations of readers and audiences have asked the same question with regard to the identity of the play itself. The Merchant of Venice appeared in print for the first time in 1600 as The most excellent Historie of the Merchant of Venice; however, on the sheet which followed the title page appeared another title, The comicall History of the Merchant of Venice. Near the end of the 20th century, one publisher of Shakespeare’s works listed the play as a tragedy. History? Comedy? Tragedy? In the end, the play seems more of a conundrum than anything else. In shaping The Merchant of Venice, Shakespeare consulted a number of sources that ultimately yielded two plots and a sub-plot. There are, in fact, two climaxes in the structure of the play, the first at its center, when Bassanio wins Portia—the kind of climax typical of other Shakespearean romantic comedies. The second climax comes at the critical moment of the courtroom scene, when Shylock comes perilously close to winning his case against Antonio. The theme of love as selfless giving finds its finest flowering in Portia’s offer of herself to Bassanio. After Bassanio finds her picture in the lead casket, she gives him everything: “Myself, and what is mine, to you and yours / Is now converted.” Her complete gift of self underlies the famous speech on mercy in the courtroom scene, but it is withheld at the end of the scene, when she puts mercy aside to render judgment. The Fifth Act serves as a coda to the play, reinforcing the theme of selfsacrificing love in the resolution of the quarrel over rings. But the damage has been done, and audiences emerge from performances of the play unable to forget the vivid “Hath not a Jew eyes” speech or the image of a Shylock leaving the play bent down under the weight of burdens. 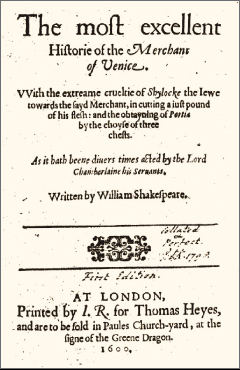 The play remains a conundrum, in Kenneth Rothwell’s words, “the woefullest but most complicated comedy ever written.” But, second only to Hamlet in popularity among Shakespeare’s works, The Merchant of Venice will continue to attract readers and audiences seeking to understand its complexities and to enjoy its vividly realized characters.